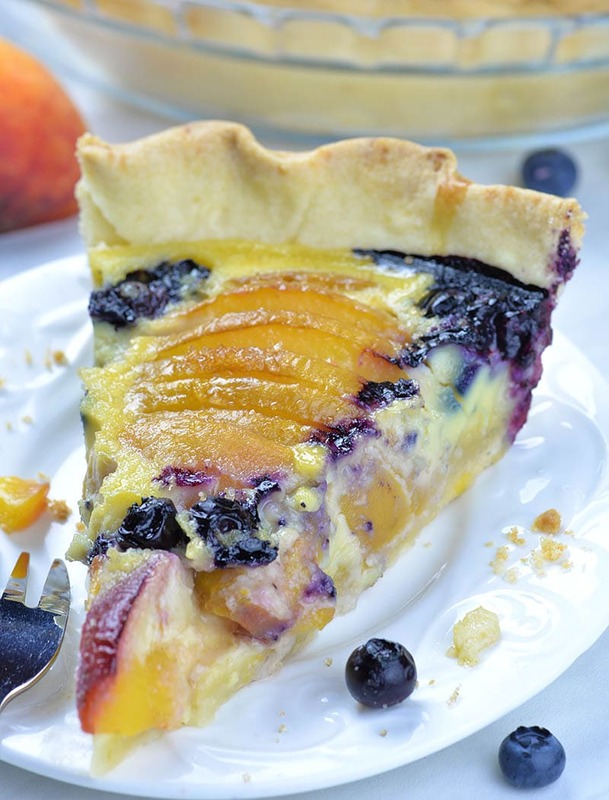 Impossible Peach Blueberry Pie-homemade buttery pie crust filled with creamy vanilla custard, fresh blueberries and sweet and juicy peaches, topped with whipped cream is perfect summer treat. 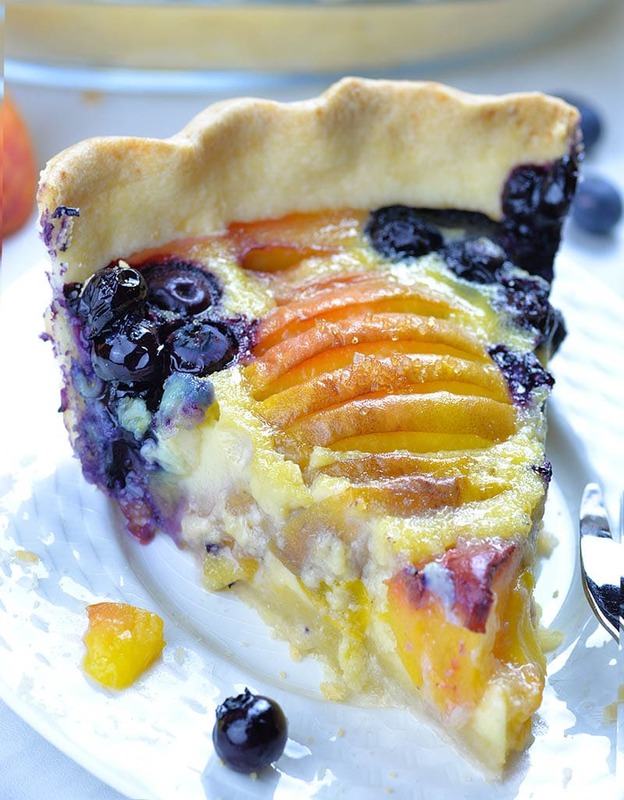 This Impossible Peach Blueberry Pie is delicious dessert for summer. I’s made with seasonal fresh fruits, homemade pie crust and irresistible vanilla custard filling. Vanilla custard filling loaded with fresh fruits tastes like classic Clafoutis. Have you ever tried my Cherry Clafoutis, rustic French dessert with vanilla custard and fruit? This delicious dessert made with fresh, sweet, juicy cherries is ridiculously easy to make, but it will impress your guest and it’s and totally budget friendly!!! This time for my Impossible Peach Blueberry Pie, I used combo of vanilla custard, peaches and blueberries, but I added homemade pie crust as a base for delicious filling, too. How to Make Homemade Pie Crust from Scratch? To make the crust, in food processor pulse flour with sugar and salt, then add cubed chilled butter and pulse until it resembles coarse meal. If you don’t have the food processor use pastry blender or fork, it will work fine, too. Then, add 2 tablespoons ice water into the mixture and pulse. If necessary, add (one by one) two more tablespoons ice water and pulse. 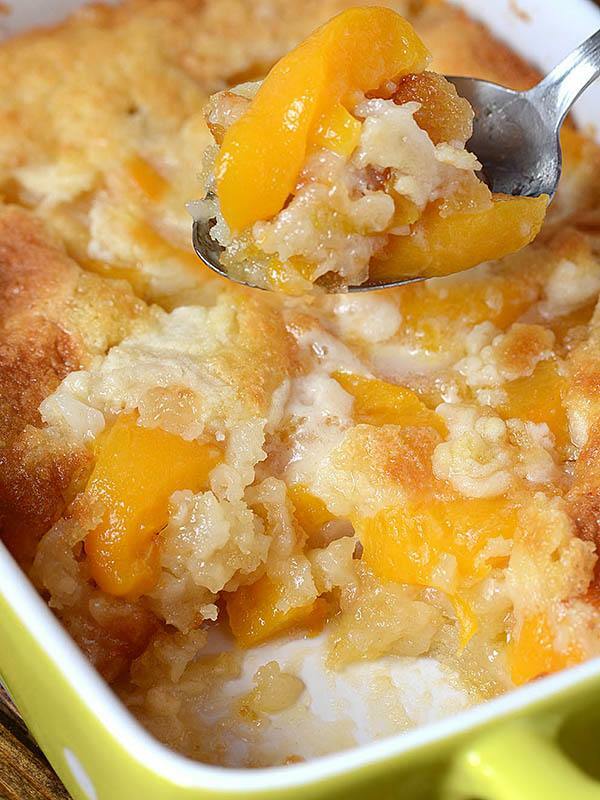 The mixture should hold together when squeezed but do not overmix, it should look crumbly. Shape the dough into a disc and wrap, set in the fridge at least 1 hour (you can store it overnight in the fridge). Next, dust the work surface with flour and roll out the dough to make 12-13 inches circle, transfer it in 10 inch pie dish, fold the edges and crimp with your finger. Set in the fridge while prepare the filling. Filling is simple mixture of eggs, sugar, flour, milk and vanilla. 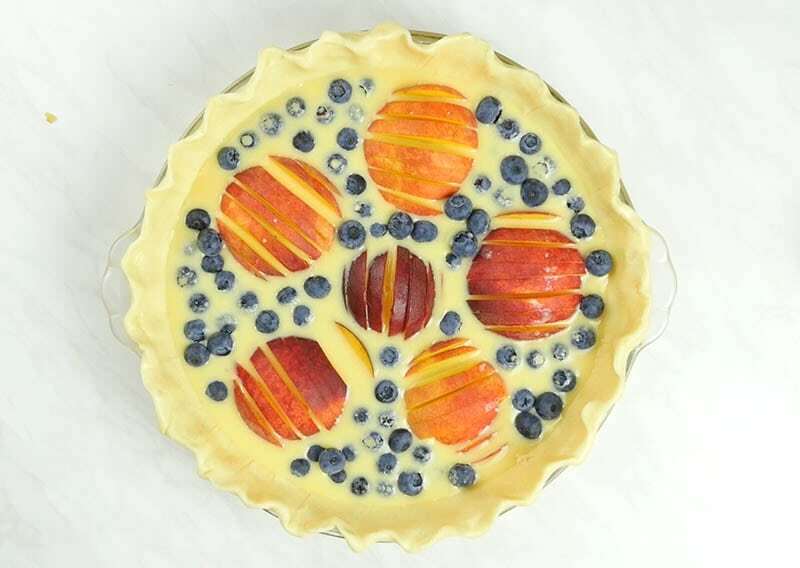 Before you pour the filling in the crust you should arrange sliced peaches and fresh blueberries. As this is summer treat it should be loaded with fresh fruits, right?! It’s so refreshing and very tasty. To make the crust, in food processor pulse flour with sugar and salt, then add cubed chilled butter and pulse until it resembles coarse meal. If you don’t have the food processor use pastry blender or fork. Add 2 tablespoons ice water into the mixture and pulse. If necessary, add (one by one) two more tablespoons ice water and pulse. The mixture should hold together when squeezed but do not overmix, it should look crumbly. Shape the dough into a disc and wrap, set in the fridge at least 1 hour (you can store it overnight in the fridge). Dust the work surface with flour and roll out the dough to make 12-13 inches circle, transfer it in 10 inches pie dish, fold the edges and crimp with your finger. Set in the fridge while prepare the filling. To make the filling, mix together eggs, milk, flour sugar, melted butter and vanilla. The mixture will be very thin. 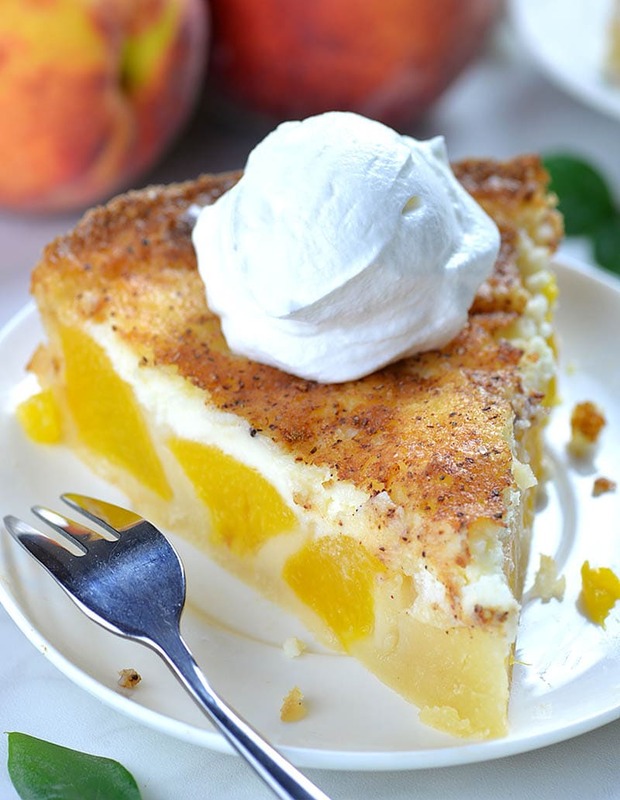 Slices peaches in half, remove the stone and slice each half in thin slices. 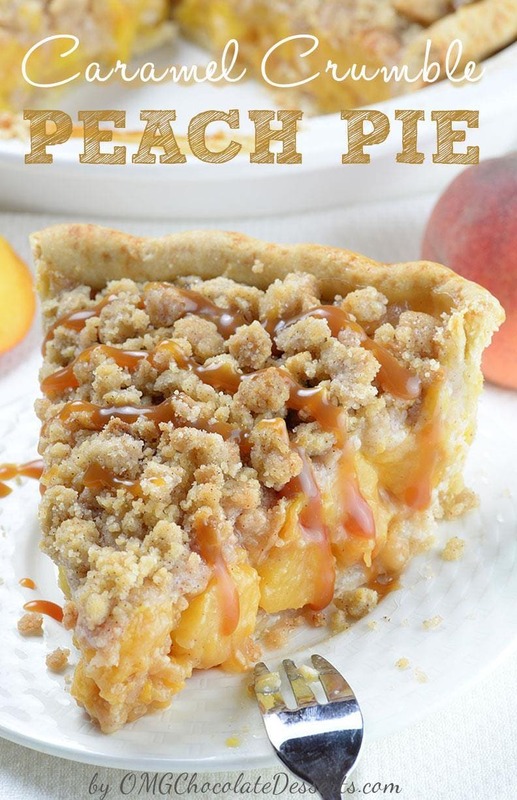 Gently transfer sliced peach half and place in pie crust (watch to slices maintain the shape of peach halves) Place half of one peach in the center of the pie crust and remaining 5 or 6 sliced halves of peaches arrange around the center. Pour half of the filing mixture gently around the peaches. Scatter half of the blueberries between the peaches. Pour remaining filling and to with remaining blueberries. Sprinkle with sanding sugar on top. Bake for 35-40 minutes at 350 F or until it’s set, but still just slightly jiggly. It will completely as it cools. If i use a ready made pie crust shall i blind bake the pastry shell first ! ?and then pour the custard filling and bake again!? Why is it called impossible? I’m going to assume 1/2 stick of butter, cubed for the crust but can you clarify and correct the recipe please? Looks lovely! Hi Kat, yes it’s 17″ cup, I’ve just corrected it. Looks like a really nice dessert. You don’t mention a baking temp? I would also brush the Shell with egg white before adding the filling unless you bake it blind beforehand. Beautiful and delicious but best of all, SUPER EASY!!!! half of what for the butter? Hi Kathryn, it’s 1/2 cup of butter. Bake 35-40 minutes at what temp? Says so right after the time. 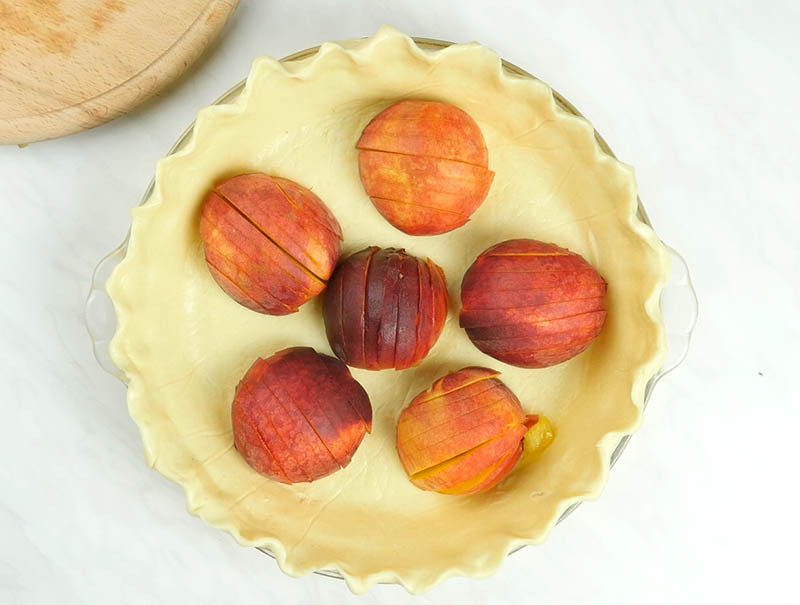 I’m trying to make this pie, I can’t find anywhere what temperature to bake it at! Hi Aya, bake at 350 F.
I made this as directed, and baked it at 350F since there is no temperature mentioned in the directions. After 55 minutes of baking, there was a “Santa Claus” jiggle in the center that has been indicative of done custard pies for me in the past, so I removed it. After it cooled, carryover heat finished baking the pie and there was no jiggle. However, the pie was no where near done. All around and in the center peach, the custard filling had a liquid layer between the gluey bottom and baked top. And I was not impressed with the taste. While the fruit was quite nice, the custard was very much like a vanilla-scented flour glue. Very unappetizing texture and inadequately sweetened. Would it be helpful to blind-bake the crust? That’s what I usually do for pumpkin pie, and a long as it is tented while baking the filling it comes out great. Additionally, should the pie be allowed to cool in the oven (turned off) to prevent weeping? Typically with custard pies, the slower the cooling, the better the outcome. Planning on making this for Easter, would this be ok to make ahead by like two days?